The Nashville Urban Design Forum welcomed world-renowned architect and sculptor Yugon Kim to the Frist Art Museum, where he spoke about his creative process and the development of materials. Last month, in Columbus, Indiana, he completed the first hardwood cross-laminated timber (CLT) structure in the United States. CLT technology has the potential to revolutionize the way wood is used as a building material. With his business partner, Tomomi Itakura, Kim curated the National Building Museum’s Timber City exhibition, and their firm, IKD, received a $250,000 US Forest Service Wood Innovations Grant for further work on CLT—the only architectural design firm selected from more than one hundred applicants. Kim’s impressive portfolio includes the recently completed extension of Boston’s Isabella Stewart Gardner Museum; as a member of Carlos Zapata Studio, he worked on Chicago’s Soldier Field, Ho Chi Minh City’s Bitexco Financial Tower, New York’s Cooper Square Hotel, and a number of private residences. 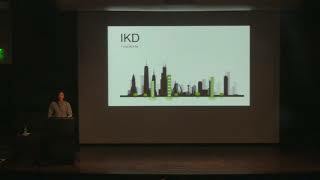 In addition to his practice at IKD, Kim serves as the Boston director of TSKP Studio, chair of the Boston Society of Architects Museum and Exhibition Design Committee, and co-chair of the Harvard Asian American Alumni Alliance’s Boston chapter. He is on the faculty of the Rhode Island School of Design and has worked not only as an architect and a fine artist but also as a custom furniture fabricator. This talk was presented in partnership with the Nashville Civic Design Center, LP Building Products, and UT College of Architecture.